We understand that you have odds and ends around the house that need to be fixed, improved and maintained. However, you simply deal with them out of frustration because it’s not worth hiring a carpenter to fix your banister, an electrician to fix that faulty light and a plumber to make that drain more efficient. 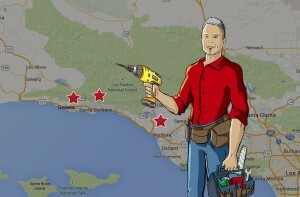 Now, one service can do it all, and you can have a handyman at your beck and call. That’s right, with our Handyman for a Day program, you can hire (or win – see below) one of our qualified, experienced and knowledgeable handyman for six hours, they will be well equipped to handle any fixing you need done. Say goodbye to the honey-do list and hello to efficient, affordable handyman services. For a chance to win, simply fill out an entry form! It’s that easy. Our winners are randomly selected from a collection of all of our entries, and there is no purchase required to enter or win. Valued at over $500, winners will receive the prize of 6 hours of handyman services, they will do anything they are licensed or able to do! The handyman reserves the right to judge the eligibility of a job. The 6 free hours are chosen by the winner, but must be between 8 AM – 5 PM, Monday – Friday. If your handyman requires any products or materials, we request that the winner make these purchases. Unfortunately, these sweepstakes only apply to those inside our serviceable area, including Santa Barbara, Goleta, Summerland, Carpinteria, and Montecito.